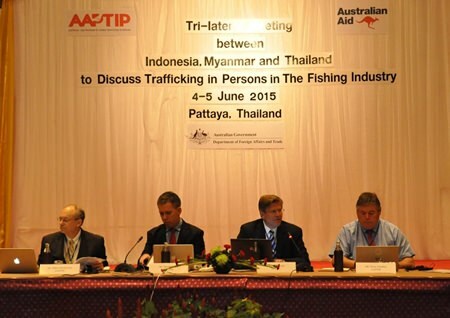 PATTAYA, 5 June 2015 – Over thirty agents of law enforcement units from Thailand, Indonesia and Myanmar gathered in Pattaya, Chonburi, during 4-5 June for a trilateral meeting on anti-human trafficking in the fishery sector. The meeting followed news exposure that a lot of Thai and foreign workers left Thailand to work as fishing laborers on the Island of Ambon and Benjina, Indonesia. Some of them were victims of human traffickers. The meeting was held in the wake of concerns over difficulties in investigating the process especially the gathering of evidence as well as law enforcement in different zones of police jurisdictions. 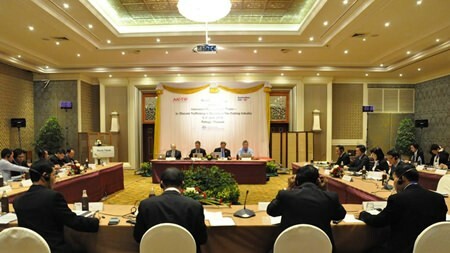 The Department of Special Investigation, realizing all these barriers, then cooperated with Australia – Asia Program to Combat Trafficking in Persons (AAPTIP), the financial sponsor of the meeting, to hold the meeting as a stage for discussing the issue and sharing experiences and seeking more effective ways to deal with the regional challenge. Mutual understanding in law enforcement system in each of the countries, along with more accurate views was believed to lead to sustainable cooperations among these nations.